The new Audi RS4 has twin-turbo V6 power that trumps previous V8 models. Picture: Supplied. MOST road tests of performance cars start with a description of its brutal acceleration and how it grips on the ragged edge. However, once you're in this calibre of car that's almost a given. Which is why this road test starts in bump-and-grind traffic, the Achilles' heel of most cars honed on and for a racetrack. 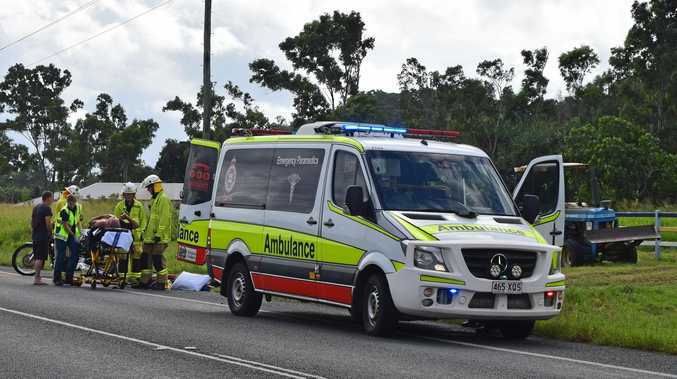 The previous Audi RS4 - among other cars of its type - wasn't all that enjoyable around town, whether it was negotiating speed bumps, roundabouts or driving on the arterials patched up by pretty much any council in Australia. The low-profile tyres and sports suspension had little give and the driver's body was left to do the rest of the shock absorption. Audi says the new RS4 is the supercar you can live with every day. Picture: Supplied. So it's some relief to report the new RS4 wagon may indeed be the first Audi to live up to the promise of the "everyday supercar". Audi has managed to iron out the bumps from the suspension and tyres, even though it is quicker and more capable than before - providing you're in "normal" or "comfort" settings. "Dynamic" is still best reserved for drivers with good backs, on smooth roads. The dramatic billboards promoting the new RS4 would have you believe the latest model is a fire-breathing monster but in fact it's rather subdued for an RS model. A twin turbo 2.9-litre V6 with an eight-speed auto and all-wheel drive has replaced the 4.2-litre V8 from the previous two generations. It has more power, significantly more torque and more gear ratios to get it moving but it's missing the V8 roar. The acceleration is genuinely impressive, although the claimed 0 to 100km/h time is the same as the smaller and cheaper RS3 hatchback sibling. There's another comparison worth making with the stablemate that costs a little more than half as much as the RS4. The five-cylinder RS3 sounds loud and angry whereas the RS4 has a more muted note. The new Audi RS4 has epic performance but it’s more subdued than its RS stablemates. Picture: Supplied. In many ways it's an engineering marvel that Audi has made a car as fast as the new RS4 feel so smooth and sublime. 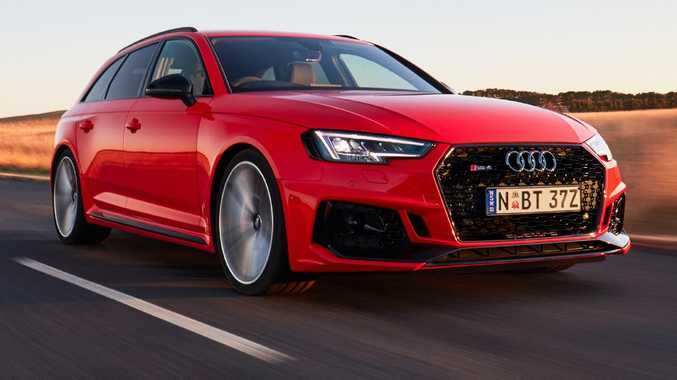 It disguises its performance by not making much of a fuss about it, but I can't help but wonder whether Audi has done too good a job at making the new RS4 a more mature hot rod. Audi Australia has ticked every option to make it as loud as possible - for example, including as standard the sports exhaust that is optional overseas. And our choice of 20-inch alloy wheels is more daring in design, too. In this price range the RS4 is close to Mercedes C63 AMG and BMW M3 money. Both of these German rivals are more brutal in how they deliver their power, so it's clear Audi is aiming for drivers who want to be pampered while their ears are being pinned back by the sheer acceleration. It even has massage seats as standard, for goodness sake. That should have been the first clue. There's a combination of real sound from the exhaust (that snaps, crackles and pops) and enhanced noise pumped into the cabin via the speakers. However, depending on buyer tastes, I fear neither may be enough when compared to other cars with this level of performance. The new Audi RS4 is a car that delights the senses and won't send you deaf - or to the chiropractor. Pampered performance … the new Audi RS4 has massage seats. Picture: Supplied. 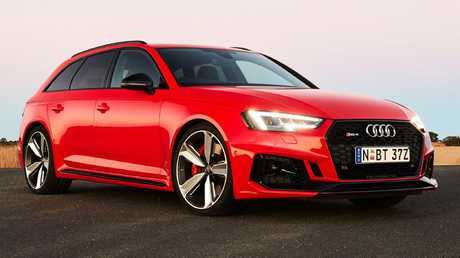 PRICE The price has gone up by about $2000 since the previous RS4 wagon, last on sale in 2015 from $151,000. The new one is $152,990 plus on-road costs but Audi says there is $22,000 worth of extra equipment. TECH Audi has added every piece of available safety tech. Highlights include exit warning (alerts to passing cars and cyclists before you get out). The start-stop traffic jam assist won't follow cars turning off the main road because a second radar monitors traffic in front of the cars you're following. DRIVING The big change is under the bonnet: the previous two generations of RS4s (2012-15 and 2006-08) were powered by a high-revving 4.2-litre V8 (309kW/430Nm). Now there's a 2.9-litre twin turbo V6 (331kW/600Nm) with eight-speed conventional automatic and all-wheel drive. PERFORMANCE The previous RS4 wagon claimed 4.8 seconds for the 0-100km/h sprint. Audi has slashed that to a claimed 4.1 secs. This might not seem like much of an improvement but at this end of the performance spectrum it's a massive leap. DESIGN The RS4 gets wider front and rear fenders (30mm each side). The "blisters", as they're called, and the vents on the edge of the headlights and tail-lights are said to be inspired by the original Audi Quattro race car used in 1989 IMSA GTO series in the US. 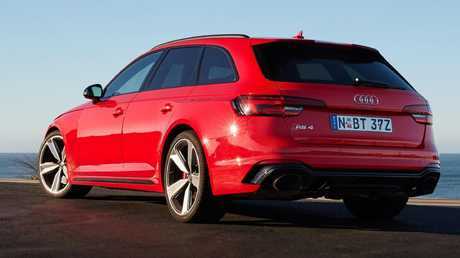 The Audi RS4’s bulging fenders are 30mm wider each side compared to the standard A4 wagon. Picture: Supplied.